FREE airport pick up for booking 4 nights in private room with Bathroom. My Hotel Cairo is located in downtown Cairo, directly across the street from the Egyptian museum. We are only a few minutes walk to the Nile river. Most of our bright cheerful rooms have a balcony to enjoy the fresh breezes. The hotel faces away from the street so that you can enjoy the luxury of peace and quiet in the middle of Downtown Cairo. The rooms have wood floors, high ceilings, and wardrobes to make you feel at home. Our friendly multilingual staff are delighted to take exceptional care of you during your stay. They will provide you with all the information you need to make your stay in Cairo and Egypt one you will never forget. We also offer free breakfast and free wireless internet. There are many cafes, Egyptian and International restaurants nearby. Taxes not included room rate. I can't fault the hostel, Mahmood & Mohammed were really good, the facilities were Great hot water etc and the beds were very comfy. I highly recommend this hostel as its located in a great spot just opposite the Egyptian museum. The sketchy building was located across the street from the Egyptian Museum. The crowded street below was very noisy from morning until night. I recommend earplugs. 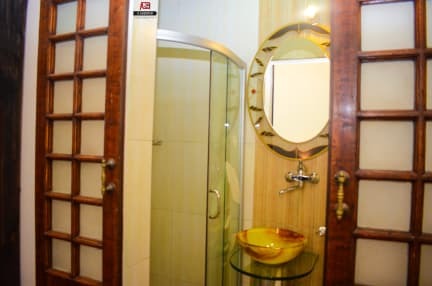 I had a spacious private room and small bathroom that was clean and comfortable. I had a nonsmoking room, but there was no escaping the fumes from people who smoked in the hallway and the reception/breakfast area. Cigarette smoke is ubiquitous in Cairo. The staff was great, especially Muhammad and Mahmood. I enjoyed the city tours. It was a wonderful experience staying at the "my hotel" Cairo. Not only is it located at the heart of the town, but it is very accessible and secured. The staff is welcoming and the atmosphere is pleasant. The staff was of great assistance since this was my very first time in Cairo. They orientated and guided me at each step of the road. I look forward to visiting Cairo and the "my hotel" next time. Brilliantly centrally located next to the Cairo Museum and close to the metro getting out and about was very easy. Breakfast was really nice and filling with a social atmosphere in the common room eating with others. The staff were constantly friendly and accommodating. The whole place was always kept clean. The beds were incredibly comfortable and bathrooms fine even when they turned into wet rooms as the shower is small and walless. A satisfying and pleasant stay for a short time. A very general place to stay. There is not really an open vibe. It is very solo and not a lot of information They have ready. Staff is Welcome With drinks and Everything. Tho They are not very good listeners when you say something. When I Arrived I had to Pay 300 and then iT turned 350. I gave 400 and They Told me The room was 400. I got my money Back because I insisted, But iT is not The Way. The tours They offer in my opinion a bit overpriced. But an okay place to stay. The location is great!